Saturday October 31st 1896 I was very busy all forenoon. Leonard husked today. Will and I were down town awhile in the afternoon. I finished up my Saturday cleaning after we came home. Sunday November 1st 1896 It was a beautiful day. Ott & Fanny with the baby and John, Hatt, and Mrs Ashley and Belle Murry were out for dinner. We had such a good visit. Will and I talked till bed-time after the supper was done. Monday November 2nd 1896 Will helped me wash this morning and I got the house all in order and dinner half past eleven. I ironed in afternoon and Will took corn to the valley. Tuesday November 3rd 1896 Busy all forenoon with dinner. Ida & Elmer Anderson here for dinner. The boys went in town to vote. I worked on my quilt. Wednesday November 4th 1896 Will went in town to have harness fixed. McKinley is elected President by large majority. Will took corn to the valley in the afternoon. I finished quilt and began some aprons. Thursday November 5th 1896 I was busy all forenoon with dinner. Will took corn to the valley. I finished my aprons and cut carpet rags in afternoon. 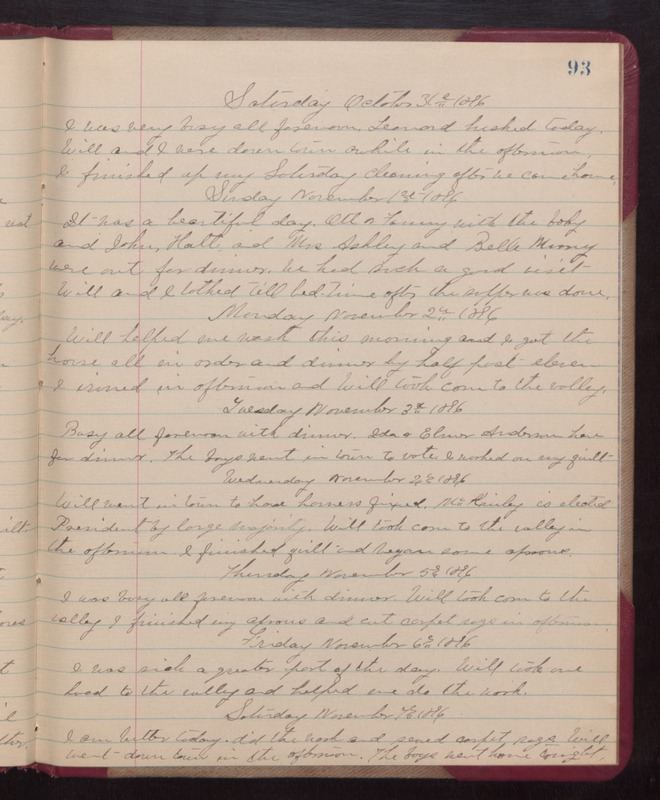 Friday November 6th 1896 I was sick a greater part of the day. Will took one load to the valley and helped me do the work. Saturday November 7th 1896 I am better today, did the work and sewed carpet rags. Will went down town in the afternoon. The boys went home tonight.